Suzuki 800 has ruled the rural and urban environments of the sub-continent of South Asia. 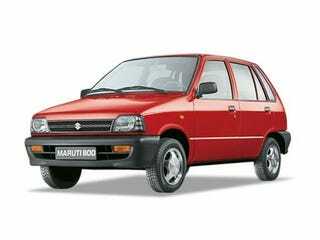 India and Pakistan are the two countries whose people got a vehicle which ran for 30 years and still continues in Pakistan as Mehran. Talk to anyone, and they will affirm that this car is like Hilux of the car world. When I heard Mr. Ratan Tata present the Nano, I was bewildered to hear that the rich bloke care about the people so much that he built a car just for them. But Mr. Ratan Tata, you aren't the first person who took the oath to provide a car to the people all around the world riding on 2-wheelers that shall; work as a protector from; the scorching rays of sun, the rain, the dust and the rich-blind-drunk-drivers who want to kill you although you stand little chance to survive such an unfortunate encounter however, the car can after receiving a hammer surgery. It all began for our part of the world with the cycle; your wife or son or mother or even your khala holding a big umbrella at the back of your cycle covering the heads of both. But that does not do the job, you're still exposed to dust, rain, mud, noise and the worst of all, you do not have any speed. I'd rather consider walking over taking my wife somewhere on a cycle if I had one. But we had to ride it, primarily because we did not have money, neither do we have that now but who cares. In the era of love-making when our Politicians did not know what population crisis is, the concept of going on long-drive in the monsoon-rains or the sunny afternoons or sleepless warm nights with your beloved didn't exist which then gave birth to the population crisis. So then we had some Japanese clean shaved men come down to our humble part of the world. Those men had the same aim as Mr. Ratan Tata. Suzuki first began the production of the Suzuki SS80 or Suzuki FX as we call it and, in 1988 (Year with respect to Pk), Suzuki ceased the production of FX and brought in the 2nd generation Suzuki Alto which you'd call the 800 or Alto, in the time when the world was witnessing the departure of second generation Mehran(Alto) that came in 1984 and left in 1988 with a new model as its replacement. However, I would like to make one thing very clear here that when we talk about new generation or new models of cars, we talk literally. The whole car including its design, safety standards, engine, fuel mileage, comfort, drive, etc are upgraded to newer technological standards. However, nothing like the aforesaid happens in case of the 800. The 800 remained as is available in the market til 2013 however, new cars were also introduced as Alto 800. The 800 is still one of the only cars in the whole world which to this date uses a carburetor engine although an EFI system was introduced late in 2000s. Remember the SS80(FX) I told earlier shares basically the same F8B engine with the 800 which was developed by Suzuki in the early 80's. That very same engine to this date is used in the 800 we have or had. Suzuki 800 was a cheap car with seats for 5 skinny folks, 4+1 gears with their lever, a steering, cheap plastic dashboard/panels, 4 tires, 2 front and 2 rear lights, a horn which is a necessity in our traffic, 2 front disc brakes and 2 rear drum brakes, windows, pair of bumpers one for the front and the other for the rear and last but not the least, The 796cc engine from the past which is a blast. I don't know if you like the old beat or not, but it is to be accepted that it is the cheapest car to keep and buy until the Nano came along. Parts of other vehicles of various ranges are expensive once you come to know about 800's parts. Even the Hilux's parts are expensive but the Hilux can still function to perform its duties, whereas the owner of 800 flies by in their car since he does not care whether his 800 have them or not, seriously they don't need it and even if they do have, then they don't use it. But if they would like to use then it just cost 35-40 Rupees only. And if your speedometer stops working, you do not need to fix them because the 800 won't go over 60-70 kmh in the city, now there's no ECU limiter in here doing that. Sometimes, to fewer folks, the brakes don't matter; working or not they are driving it. Then the hand-brake which in most of the Mehrans on the road except those who just got off the assembly line. Hand-brakes are dead hence they put it in any gear after parking. The ultimate attraction for the buyer is its glorious fuel mileage long before all the Prisues and other fuel efficient engines that came. I have met people who say that we fill the Mehran with fuel after a set number of days, not through how much the cars been driven or what the meter shows. How cool is that; especially for students and the folks who earn under 20k Rupees/PM. Unlike the German tech-fest of cars, assume your car broke in the mountains(Don't doubt that it can't go there, it can very well) where there is no reception available for your mobile let alone the walk to find a mechanic but even if you do find one there is no chance that they would know how to fix your car unless it's an 800 which has become a fact in the Sub-continent that it is indeed the cheapest car to fix with everyone claiming to know how to fix it. The resale value of 800 is pretty impressive as well. Hard-cash as many would say. An 800 in mint condition or not, will sell since there are buyers of every kind looking out for them. Stolen 800s, 800s to just buy groceries and fetch kids from the school, totaled 800 because every (remaining) part of the car can be put to use. We can say that one buys the 800 as its a faithful friend due to its natural elements. The 800 is a tool, a tool which everyone likes to keep for their matter of need. Hence the legacy of 800 shall live on with its presence on the roads of the South-Asian sub-continent undisputed.